Colette White is CEO and Principal Trainer at Infinite Excellence. Colette’s first introduction to NLP was through the giant of all motivators – Anthony Robbins. Having attended his Mastery University programme she was inspired to take her NLP skills to another level. Colette qualified as a Trainer and Master Practitioner of Neuro Linguistic Programming, Time Line Therapy™ and Hypnosis with the world renowned and respected Dr. Tad James M.S.Ph.D, Master Trainer of NLP and Hypnosis and creator of Time Line Therapy™. Committed to her own and others’ personal development Colette has since become the first female to be awarded Master Trainer of Hypnosis by the American Board of Hypnotherapy and a Master Trainer of NLP awarded by the American Board of NLP for Europe. In addition Colette has extensive business experience. She has a BSc (Hons) in Economics, specialising in Accounting and Finance from the London School of Economics and is a qualified Management Accountant, with over 12 years experience in Finance and Strategic Programme Management in the Retail sector. Colette’s passion and commitment to the field shines through in her work. She has a real desire to help individuals and businesses reach their true potential and to be infinitely excellent in whatever they put their minds to. 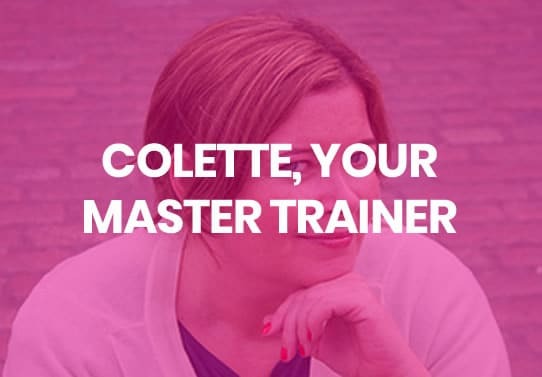 Whether you are attending a training course or having a breakthrough session with Colette, you can be guaranteed that you will get results, be inspired, receive the best care and attention, and have lots of fun! If you think it is time to build a life or business of excellence why don’t you have a look and get a feel for how Infinite Excellence can work with you. If you have any questions or would like to talk we are here to help. Enter your details to receive inspiration, news, updates about our products and services plus great offers. Colette helped me quit biting my nails. I had being biting them since I was a baby and tried several times to give up but it never worked! Colette is so relaxed and the technique that she used was fun and easy. That was 3 months ago and I have not bitten a nail since!